Who would have thought that the biggest beer I'd review on this blog (up until this point anyway) would be a pumpkin beer? 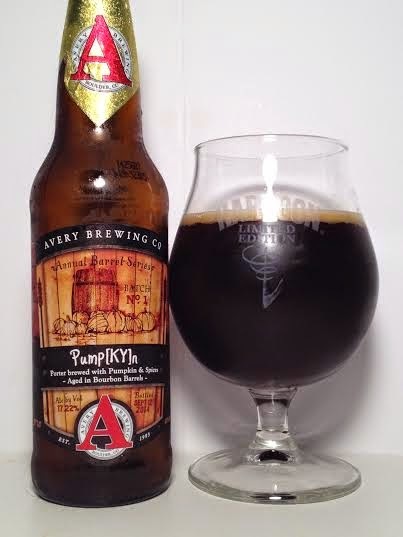 Pumpkyn is a bourbon barrel-aged porter brewed with pumpkins and all of the associated spices. This baby clocks in at a staggering 17.22%! Pours almost pitch black, maybe a deep, dark brown. Got a finger of khaki-colored head which for such a high abv, stuck around for the duration of my drinking. You'd think the first thing I'd get on the aroma was the bourbon, but it's actually the cinnamon and a lot of nutmeg. The bourbon is not as powerful as the spices, but it's there. There's some roasted malt, and as it warms up, the pumpkin begins to shine through. On the taste, pumpkin is the biggest flavor out of every ingredient with cinnamon being the dominant spice. The bourbon is smooth and sweet and I detect a small raisin or plum flavor. There is some alcohol taste, but at 17.22%, that is to be expected. Luckily it isn't off-putting when combined with the other flavors. This was surprisingly thick and fluffy for a porter; it can be compared to a lot of stouts. At the same time, it has pretty decent carbonation. The abv causes a warming sensation in your throat and chest, but this actually drinks nicely for the alcohol content. I was concerned with this being too hot given the gravity of the beer, but Pumpkyn is a solid pumpkin porter with great bourbon taste that accentuates the spices and pumpkin mash.